Snow Go Mountain is the special level of World 5 found in Yoshi's New Island. This level is entirely vertical, up until the pipe at the very top. 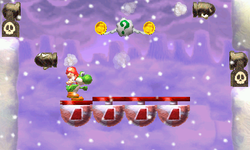 Yoshi starts the level in a snowy area with Number Platforms and Bullet Bills, which Yoshi will have to use to get up to higher areas. He will soon need to switch to using Goonies and will switch once again to Bullet Bills. Eventually, Yoshi reaches a pipe which takes him to the Goal Ring.